The original Grand Tarkin was designed as a work-horse bass fuzz for the gigging bass player. No frills and no gimmicks, just solid bone-crushing tone to drive the bass in any band. 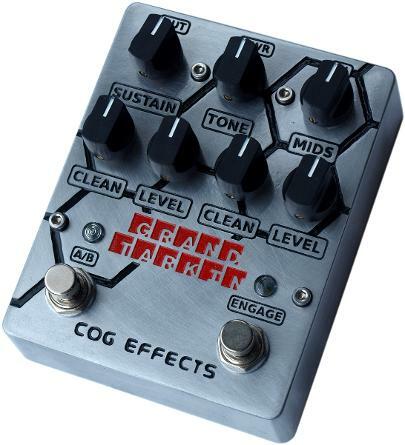 The second iteration of the Grand Tarkin retains the same great sound but adds extra flexibility. Sustain, Tone and Mids controls are all up to the top, and the Blend and Level controls of the original have been replaced with two pairs of individual Fuzz and Clean level controls. The A/B footswitch switches between the two pairs of level controls giving two preset blends of fuzzed and clean signals - ideal for being able to kick up for the chorus or solo. The clean channel is filtered to integrate with your fuzz in a more musical way than a full-range clean blend. Instead of the blended signals sounding "side-by-side" it sounds like one huge, fat and brutal fuzz tone. The end result is a versatile and massive-sounding bass fuzz designed to deliver on any stage.